Elvis is a short-haired, gray tabby cat who's never met a stranger! He was a stray cat in Oak Cliff before deciding he needed a forever home, which he is so patiently waiting for. If you're looking for an aloof, standoffish cat, Elvis is not your boy - Elvis loves love! He wants nothing more than to be together and likes any activity as long as he's with someone he loves, but he's calm and quiet when he needs to be. He is curious and engaged with the small resident canine in his foster home. Now that he is adjusting to life as a pet, he enjoys athletic, active play with toys. He is a door-darter and will need to be in a home that can manage that. He's vocal around mealtimes but is polite otherwise. 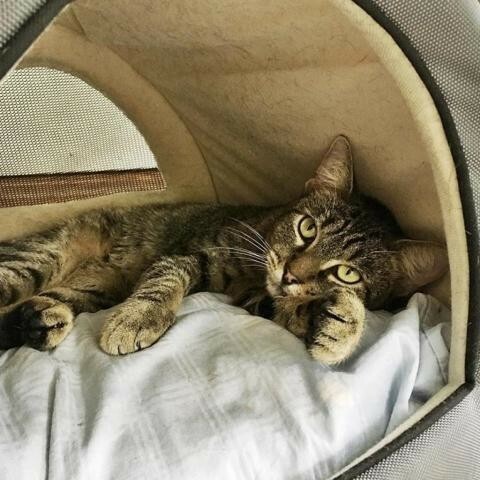 His foster home thinks he's a purrfect cat and has successfully won over cat-lovers and non-cat lovers alike with his charming personality. He's a petite boy at around 9 lbs, but he's full of character. All Dallas Pets Alive adoptable pets are spayed or neutered, microchipped, and up to date on vaccines upon adoption. The standard minimum donation for cats over six months to seven years is $100, kittens under six months is $150, cats eight years and over are $50 unless specified otherwise. You can view all the adoptable pets and fill out an adoption application online on our website at http://dallaspetsalive.org/adopt/adoptable-cats/ . For more information, you can email adopt@dallaspetsalive.org.